There are 12 posts filed in Pens (this is page 1 of 2). One of the few types of nib that I don’t – or didn’t – own and might actually want to use is a music nib. I can’t even read music, let alone write it, but to summarise, a music nib is a type of stub designed to have a particularly regular flow and be usable at odd angles to the paper. 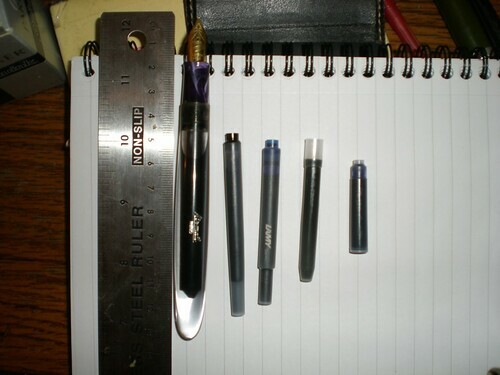 Given that these are three qualities I that I am very fond of in nibs, I thought that it was worth buying myself one for my birthday, or at least excusable. There are a few different companies that make music nibs – looking around at reviews I judged that the Platinum #3776 received the best marks for nib quality, which was after all why I was buying it, so I ordered one from Andy’s Pens. 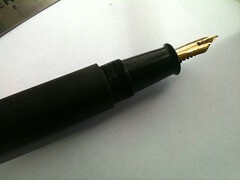 It is a medium-sized cartridge/convertor pen, traditionally decorated – black with gold trim, pleasant-looking but not particularly unusual when capped. 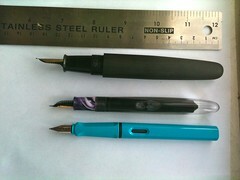 The nib, though, is different enough to surprise even a casual onlooker, mostly because it has three tines. Or two slits. Or in fact both. I have no idea whether this actually makes any real difference over one, well-tuned slit (two tines etc) but it’s certainly good when used at all sorts of angles to the page. I tend to hold pens at a very high angle, and often, italic-ish ones will complain about this and refuse to respond properly unless aligned very carefully with the paper – I’ve had none of this sort of insubordination from the Platinum. 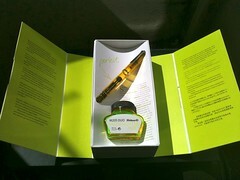 It’s also extremely smooth, the ink flow is regular and it’s not too wet. 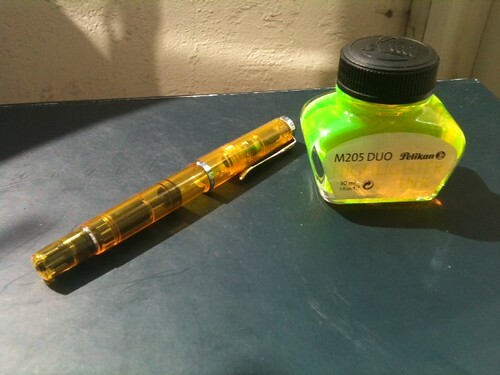 I should try it with some of my “dryer” inks, like the iron galls. 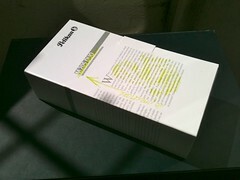 It’s certainly a noticeable stub – there is a writing sample at the end of the above photoset. I’d say that it was around 1.25mm on the downstroke, and, oh, 0.4mm on the side? Something like that anyway; I don’t have the tools to measure this exactly. My main problem in using it is that, while I’ve improved my handwriting recently, I haven’t trained myself with italics, and the broader nibs can be hard to write with in the first place if you’re used to finer pens (which I am). This means that everything I write looks clumsy and irregular. Oh well. 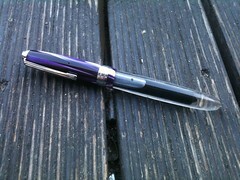 Seeing as I’m writing about one pen with a broad nib, why not another one? I went through a phase of wanting every type of Lamy 2000 around – now I come to think about it, pretty much exactly a year previous to my buying the Platinum, perhaps it’s some sort of reaction to winter that I have – and one of the models I ended up with was the 2000 with a broad nib. 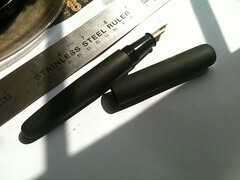 When I first tried this pen I was stunned, and really quite upset, by how vast the line was. It doesn’t look like a particularly huge nib to the eye but it really is – the line is about as broad as the Platinum on the downstroke but almost the same size horizontally, too. 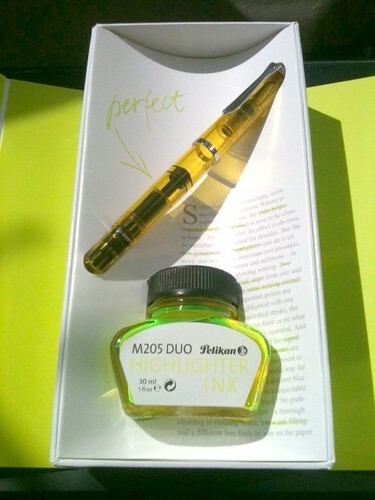 I wondered whether it had been given some sort of freak triple-broad nib by mistake, and considered sending it back as I would obviously be unable to use it for anything at all. Colourful, shading ink always looks nicer coming out of a broad nib – you can see the variations and even lighter colours are readable. This is as opposed to fine nibs, where you really have to use dark colours or black, or you’ll just find it hard to read what you wrote later on. 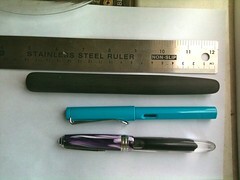 These things combined make it a terrific pen for writing, as long as you’re not limited by space or amount of paper. When I wrote my NaNoWriMo last year I used this pen at least 75% of the time; you don’t get as many words per page but it encourages you to keep going longer. It is also good for the sort of scribbles and notes where you’re not limited by space and you’re mostly writing to sort out ideas in your own head. 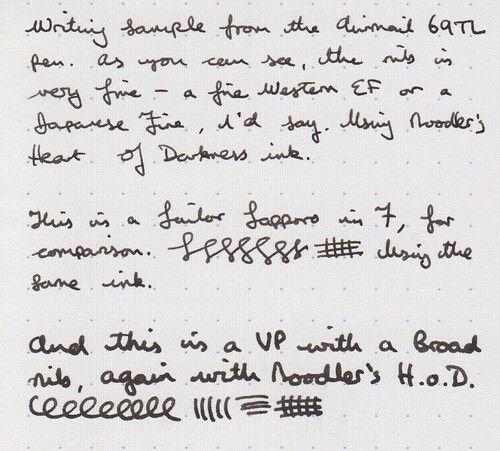 Particularly on A4 – I like using this pen with black ink on an A4 Rhodia pad. 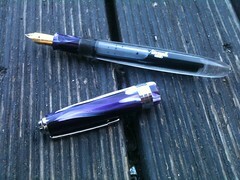 Not such a great pen for jotting things in a pocket notebook. I can’t remember where I got it, now, but I think it was from The Writing Desk.